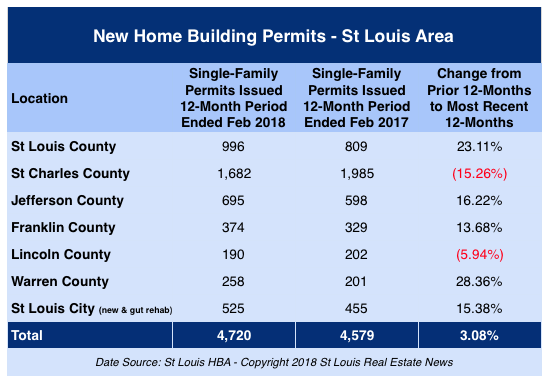 New home construction, based upon building permits issued, is up overall for the 7-county area covered in St Louis by the Home Builders Association of St Louis and Eastern Missouri (HBA). For the most recent 12-month period reported for this area, through the end of February 2018, there have been 4,720 single family permits issue versus 4,579 for the prior 12-month period, an increase of 3.08%. As the table below shows, 5 of the 7 counties reported on by the HBA have seen double-digit increases in new home construction during the past 12-months, Lincoln County and St Charles County being the exceptions. St Charles County has suffered the most, with a double-digit decrease in home sales. The St Charles decline is likely at least partially contributed to a lack of developed lots.